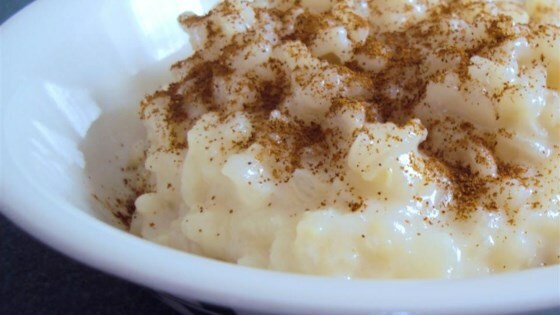 "This rice pudding is tasty and a very easy to make for breakfast or dessert. It is also gluten-free." Bring water to a boil in a saucepan. Stir rice, butter, and salt into water until the butter melts. Cover saucepan and remove from heat. Set aside until water is absorbed, about 5 minutes. Stir milk, brown sugar, cornstarch, and vanilla extract into the rice; bring to a simmer over medium heat while stirring; cook until the rice has the consistency of loose oatmeal, about 5 minutes. Ladle pudding into bowls and dust with cinnamon.